What exactly are Bouncing Woolies and how will they benefit me? Bouncing Woolies are wool dryer balls. They save time, money and energy. They are made from 100% wool and are felted multiple times (more than most other wool dryer balls on the market). Felting keeps them from falling apart in your dryer. How will they save time, money and energy? The woolies circulate through your dryer, separating the clothing and getting the warm dry air right down to the core of the dryer load! They also soften fibers through the gentle friction of the felted wool fibers against your cloth fibers. So, not only do they save money by lessing your drying time, but they also mean you do not need to purchase chemical-laden fabric softeners or dryer sheets. In short, the more woolies you add to your dryer, the faster the drying time, the softer the softness and the more money saved. Using four woolies in your dryer can lessen drying time of large load up to 25%, and 30-45% off your small loads! We recommend starting with four woolies and adding more later. How long will the woolies last? Your Bouncing Woolies will last at least one year. If you add scents to your woolies, these scents won't last a full year (but you can always scent them again with the Re-scent Packs. If I'm allergic to wool, can I still use Bouncing Woolies? Yes, definitely! Many of Bouncing Woolies's clients have tested the wool dryer balls on their wool sensitive family members. Because the wool isn't directly in contact with your skin, it does not cause a reaction. All allergens are stripped during the Bouncing Woolies production process. What's the difference between rubber or plastic dryer balls and Bouncing Woolies? Wool is 100% natural, so you don't have to worry about chemicals escaping and leeching to your clothing and other laundered materials. Bouncing Woolies are also more gentle and will not tear up your laundry. There are small black 'hairs' in my natural colored woolies. What are these? In its natural state, wool is not 100% cream in color. Just like humans, sheep also have variations in their fiber color. It is normal to see small pieces of black fiber in your undyed woolies. My wool dryer balls arrived wet/damp. Are they ok? This is common during the autumn and winter months. What happens in this type of climate? Condensation and moisture. 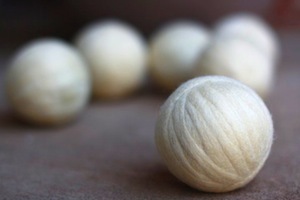 And what makes wool dryer ball work so well? Absorption. Because shipments travel from inside a warm house and post office into a cold postal vehicle and cold mailbox, your balls may seem damp or even wet when you open the package. This is very normal and means your balls are working very well! All you need to do is tumble them for a bit in your dryer or simply let them air dry. What is a Do It Yourself Re-scent Kit? 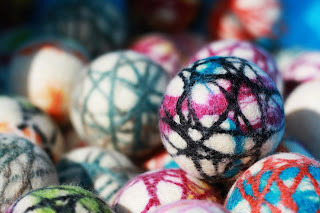 Want to replenish the scent in your scented dryer balls? This kit is for you! 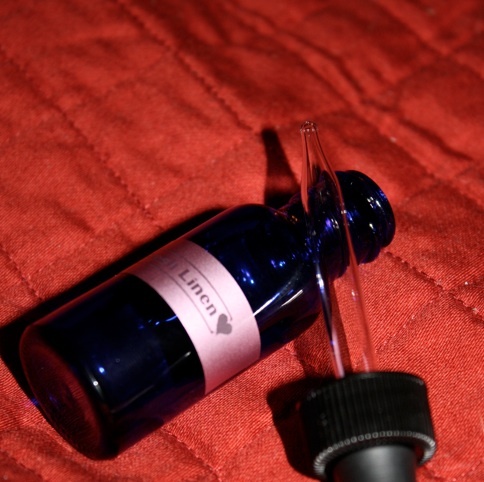 Included in the kit - a glass bottle with a dropper, and enough oil to scent four or more woolies. To use - simply remove the cap and place little drops all over your woolie. Let dry and place back in your dryer. And you a ready to go! Note - When you purchase pre-scented woolies, the scents are injected into the ball. The DIY Re-scent kit will not last as long as the injection, but will definitely give your woolies a boost of delicious scent! Made in the USA by a fabulous WAHM. Fresh Linen: a fresh and clean accord with soft, subtle back notes of powder and musk. Notes include: jasmine, lilac, peony, Egyptian musk and French Vanilla. Very similar to the scent of Downy Fabric Softener. Monkey Farts: Oh what a treat! We know you are expecting you read a disgusting description, but this unique complex is anything but disgusting! The fragrance begins with top notes of fresh bananas and juicy grapefruit, middle notes of kiwi, juicy bubblegum and strawberries, and a hint of vanilla as a base note. Pink Sugar: A fruity blend of cotton candy, lemon drops, caramel and raspberry jam on a dry down of musks.